They used to welcome tourists to the rice terraces of Banaue. Now, they welcome the entire world to our country as part of the new tourism campaign: "It's More Fun in the Philippines." 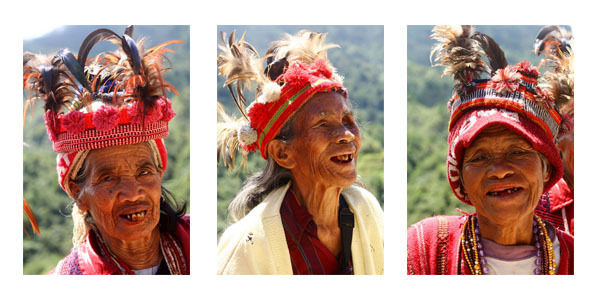 The three Igorot women in the "Tour guides" meme. This won't be a literal interpretation of the cliche about having a thousand words behind every photo. Perhaps for this blog entry, just under 250. Planning our adventure to the Banaue rice terraces in 2009, I told myself that I needed have a picture of Igorots wearing their traditional outfits. To my disappointment, there wasn’t one in sight when we got there. Just as we were about to leave though, there they were! Behind a little souvenir shop, three elderly Igorot women sat there as if waiting for us! They don't literally tour you around the area, but they do give you the warmest welcome—their coarse and very distinct voices shouting “Yehey!” over and over again. Super cute! For a little donation, they willingly took pictures with us and were happy to have their pictures taken. Unfortunately, these women remain nameless on my end. If they're still around, I don't know. Wouldn't it be a great idea to do a feature on them? If only I could go back there. Hhhhhmmm. Thank you! I'm seriously considering going back there! As to when, I still don't know. Hopefully, for a longer period of time. Pinikpikan? Oh yes! Absolutely delicious! We just tried not to think of how it was prepared. =/ Hehe. What else were you able to try? Pinikpikan is the best, really. It tastes better when old rice wine (tap-ey) and salted dried meat is added. I wonder myself which of those products are from Ifugao culture or Kankanaey culture, being married to an Igorot from both cultures :) Will be looking forward to your posts. Happy blogging!